People movers occupy a small, yet important, niche section of the expansive local vehicle market. There is no shortage of competition either with at least eight brands in this segment. The Honda Odyssey is currently the nation's best selling people mover with private buyers, just as it has been for over a year. Total YTD sales of the Odyssey is 2,167 units as at 30/9/15. The entry level Odyssey VTi has seating for eight occupants and the top-of-the-line VTi-L has seating for seven because of wide twin bucket seating (with a unique ottoman included) in the second row. 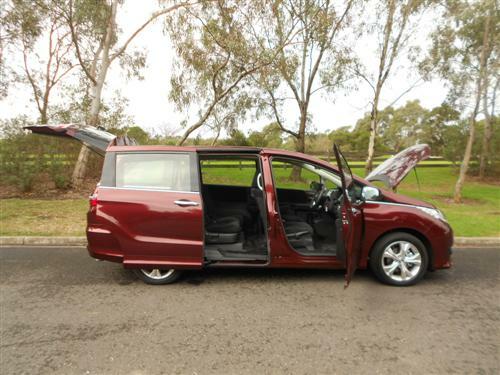 and Odyssey VTi-L is priced from $46,040*. The doors open wide to permit easy entry and egress into the spacious cabin. The seat height is admirable, nearing the desired height that is offered with mid-size sports utility vehicles, including that of Honda's own popular SUV, the CR-V. The front seats are a little wider than many cars and this will, no doubt, please some folks. Driving the Honda Odyssey is a real treat. The engine performs well and the transmission is smooth. It's what you expect with a Honda in fact. And sure enough, Honda delivers. The driving dynamics are outstanding for a people mover. 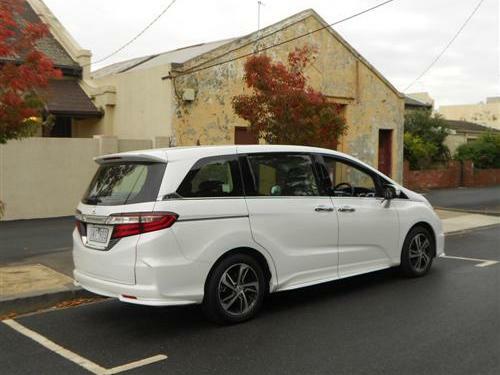 The stylish design combines a lower than typical roof height for an MPV which effects the centre of gravity in a positive manner when compared to some other vehicles competing in this market segment. Did I say stylish? Yes, this is more than a box on wheels! 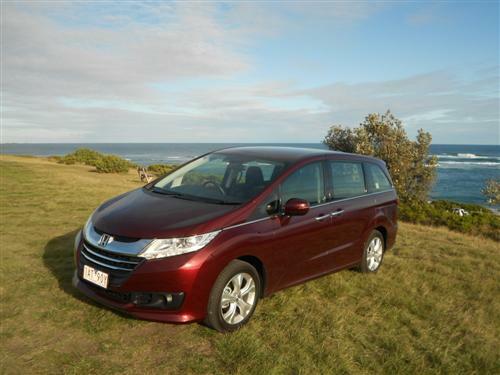 Our test of the two Honda Odysseys covered suburban Melbourne and down to the Victorian south coast near Flinders. 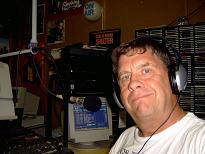 In the White Orchid VTi-L we covered 424 kms. In the Carnelian Red VTi we drove some 493 kms. A 2.4 litre 4-cylinder engine powers the Odyssey. It provides a power rating of 129kW at 6,200rpm and 225Nm of torque at 4,000rpm. The Euro5 compliant engine has an auto idle stop feature (for better or worse). The automatic transmission is of the common CVT variety. Four 17" alloy wheels and a temporary spare are standard. The factory indicate the fuel consumption rating for the Odyssey is 7.6 litres per 100 kilometres on the combined cycle. The trip meter in the white VTi-L indicate we averaged 8.7 litres per 100 kms. The red VTi recorded an average of 8.5 litres per 100 kilometres. There is no reason for complaint with the fuel consumption. The urban consumption rating is 9.4 (VTi) and 9.6 (VTi-L) litres per 100 kilometres. Quite a reasonable figure for a spacious people vehicle, in my opinion. The fuel tank capacity is 55 litres. Regular unleaded petrol is required (91RON minimum). Standard (each variant): Accessory power outlet (12V) – front and rear; Display Audio featuring: – 7-inch full-colour capacitive touchscreen – Bluetooth® phone and audio streaming – customisable wallpaper – Siri Eyes Free+ mode – Mp4 movie file play - vehicle information (fuel economy, trip computer) - 6 speaker audio system (4 speakers, 2 front tweeters) - AM/FM radio - CD player, single disc (MP3/WMA compatible) - HDMI port - USB port (x2). Compatible devices may be required for some features. Six airbags; vehicle stability assist; reversing camera; 5 star ANCAP crash worthiness rating; and much more. Standard Equipment (each variant): Three row air conditioning (very important if doggie travels in the third row during summer); cruise control; tyre deflation warning; remote keyless entry; 4-way adjustable steering column; bottle holders galore and much more. The VTi-L has appropriate upgrading to its equipment list. Tare weight: 1,776 (VTi), 1,819 (VTI-L) kg (approx). The Honda Odyssey is covered with a 100,000km/3 year warranty. 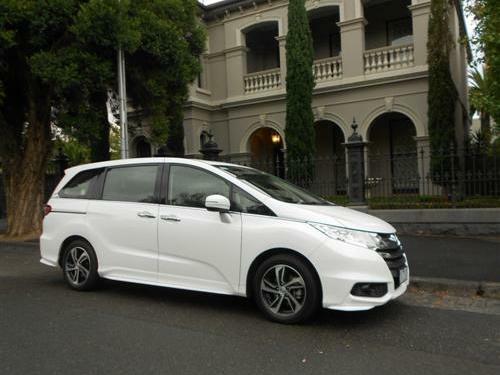 This roomy people mover packs a lot a versatility into its largish mid-size body. This makes it appealing for various reasons. 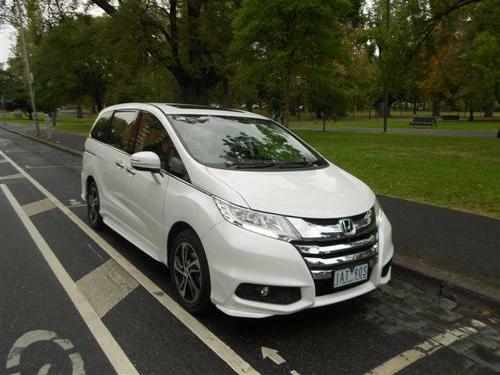 Quite frankly, the driveability and the interior packaging make the Honda Odyssey a particularly pleasing choice in its niche market place. 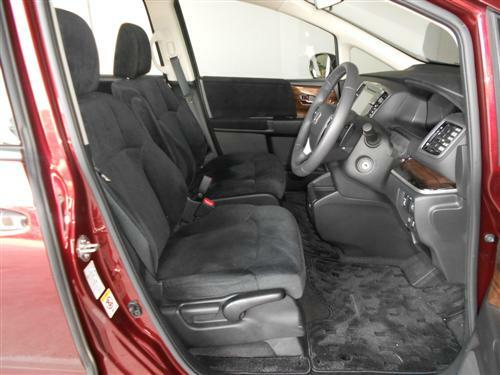 My preference is for the value of the Odyssey VTi and its nice soft fabric seating surfaces. Yet the appeal of the top of the line VTi-L will be compelling for those who desire the most with their Odyssey.